An estimated 400,000 people took to the streets of Manhattan on Sept. 21 for the largest single climate change protest to date. The People’s Climate March, which took place two days before a one-day United Nations Climate Summit, was about twice as large as organizers had expected. There were so many present that by the time the back of the march began to move—over four hours after the front stepped off—many thousands of people had already finished the 2.1-mile route. It took more than six hours for the entire march to end. The event was organized by 350.org and the liberal internet activism group Avaaz, with over 1500 endorsing organizations. While the New York march was the largest, 2646 companion rallies took place in 162 different countries. A West Coast People’s Climate Rally in Oakland, Calif., drew about 4000 participants. Despite political flaws, the march represents a huge step toward building a unified movement against climate change. The diverse crowd included groups from around the continent representing many different environmental and social causes. Large contingents of indigenous people, anti-fracking activists, anti-nuclear activists, tar sands pipeline fighters, scientists, union members, antiwar veterans, and eco-socialists were present. Groups promoting immigrant rights, freedom for Palestine, and justice for the victims of racist police violence were also present. One contingent carried a 300-foot-long banner that read “Capitalism = Climate Chaos,” created by the organizers of the Flood Wall Street civil-disobedience event that took place the next day. That event, which fell on a Monday, drew an estimated 2000 protesters, who blocked Broadway for about eight hours until cops finally unleashed tear gas and made over 100 arrests to break up the crowd. The symbolic blockade had no immediate goals other than to close the street and get media attention—or “to confront the system that both causes and profits from the crisis that is threatening humanity,” according to the “call to action” on the event’s website. Many of the participants interviewed by “Democracy Now!” showed up to protest against fossil-fuel extraction and burning. “We come from a land that is heavily resource-rich, and we came to tell the world that we’re not going to be a resource colony anymore, and enough is enough,” said one Diné (Navajo) activist. The day prior to the Climate March, the ecosocialist System Change Not Climate Change coalition and Green Party-backed Global Climate Convergence held a one-day “Converge for Climate” conference, with dozens of workshops at various locations around lower Manhattan on topics including indigenous peoples’ rights, anti-racism, fossil-fuel struggles, renewable energy, U.S. imperialism, Marxist ecology, and eco-socialism. Workshops brought together people engaged in direct struggles against pollution and resource extraction, with writers and theorists who presented capitalism as the source of the crisis and socialism as the solution. The closing plenary featured Olga Bautista, an activist working to shut down a petcoke (petroleum coke, a carbon-dioxide-heavy byproduct of tar sands) operation that coats her South Side Chicago neighborhood with carcinogenic slime, and author Naomi Klein, who told the crowd that “there are no non-radical options left” to stop the climate crisis. Organizers estimated that 2500 people attended. The march and surrounding events sparked vigorous discussion about what that movement should look like and how it can best be built. The Convergence event partially arose out of critiques of the Climate March by leftist writers, several of whom quite rightly criticized the decision of organizers to include neither a major rally nor any specific demands. The slogan put forward by march organizers was “to change everything, we need everyone.” As journalist Chris Hedges wrote in a piece titled “The Last Gasp of Climate Change liberals,” the march’s appeal to concerned capitalists opened the door to sponsorship by corporate-backed fronts like The Climate Group, which counts among its members British Petroleum, Dow Chemical, and JP Morgan Chase. Hedges dubbed the march “a climate-themed street fair” and encouraged marchers to also participate in more “radical” events like the Convergence and Flood Wall Street. We certainly concur that the spectacle of Hollywood celebrities and Al Gore marching alongside anti-capitalists points to some serious political contradictions of march organizers. However, this is nothing new to public marches organized by liberal outfits, such as the 2004 pro-Choice “March for Women’s Lives,” which featured Hillary Clinton as a keynote speaker. The fact that the march took place at all—that even liberals like McKibben no longer feel they can put faith in establishment politics to press for change—represents a stepping stone to building an effective, multi-faceted movement. McKibben pointed to successful mass movements such as those against the Vietnam War and Jim Crow segregation as the way forward for climate change activism, and we agree. While in those cases marching alone did not win the movement’s victories, the mass marches shifted political awareness throughout the country and acted as catalysts for revolutionary organizing. Likewise, the Climate March opened up opportunities for socialists and other radicals to speak with many, many people—particularly young people—who are looking for solutions to the myriad crises created by capitalism. The march gave expression to many urgent struggles taking place around the country and the world against tar sands pipelines, strip mining, oil and gas drilling, and environmental contamination heaped upon Indigenous and other marginalized communities. We would also quibble with several of the leftist critics for complaining about the march’s lack of a clear message but failing themselves to provide a message that the masses of working-class people who attended could get behind. As their alternative to “corporate PR,” Hedges, Gupta, and other leftist critics supported the Flood Wall Street civil-disobedience action—which didn’t have any demands either! 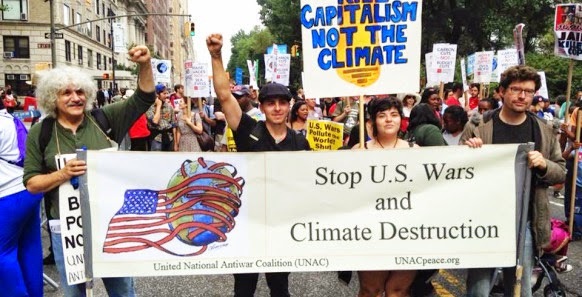 Styled after Occupy Wall Street, the demonstration’s slogan was “Stop Capitalism: End the Climate Crisis.” But how to stop capitalism is a key question that such anarchist-style events fail to address. Protesters might cheer the arrest of a man in a polar bear suit as symbolic of capitalism’s crimes, but clear, immediate, and winnable demands would make a much better point out of such arrests. They would demonstrate that capitalism is incapable of addressing the climate crisis. To answer this question, the critics might look to those who attended Flood Wall Street and suggest that similar events in the future incorporate explicit demands such as “end fossil fuel extraction!” and “100% renewable energy now!” We should also try to draw lessons from the Converge for Climate conference sessions, where various groups put forward a myriad of demands: for environmental justice, government-sponsored climate jobs, mass transit, fossil-fuel divestment, clean energy, and a halt to fracking, mountaintop removal coal mining, tar sands mining, and their filthy offshoot industries, to name a few. The overarching goal to “stop capitalism” can be viewed as implicit in all of these demands, as capitalism simply cannot meet them due to its requirement of constant expansion. Yet we cannot wait for a revolution to start addressing the imminent crisis that threatens all of humanity. Nor will simply sitting on the steps of the Stock Exchange precipitate one. Thus, when President Obama spoke at the UN Climate Summit two days after the march, he could tip his hat to protesters and still claim with a straight face that the U.S. is meeting its obligation to cut carbon emissions. He didn’t have to address the demands of the mass movement—because none were put forward in a unified voice. The obligation that Obama hypocritically referred to—the pledge to cut carbon dioxide emissions “in the range of 17 percent below 2005 levels by the year 2020”—was of the president’s own making at the 2010 COP (Conference of Parties) Summit in Copenhagen. Immediately after that gathering, which was supposed to work out an international treaty to replace the 1997 Kyoto Protocol, the U.S. was roundly condemned by climate change activists for being the wrecking ball that caused the talks to collapse. In the middle of that conference, a conspiracy of U.S. and European negotiators to strong arm conference attendees into a one-sided agreement was revealed, throwing the negotiations into turmoil. In the wake of the uproar and mass arrests of activists outside the conference, Obama jetted in and announced the back-door non-binding agreement between the U.S., Brazil, China, India, and South Africa that he now ballyhoos as being nearly met. The 17%-by-2020 “accord” was denounced by the rest of the world as an undemocratic sham and ecocidal. A team of scientists from MIT modeled the pledges made at Copenhagen and estimated that they would entail a 3.9-degree celsius global mean temperature rise. This level of warming could melt the global ice caps entirely and trigger what scientists call “runaway climate change,” where melting permafrost and warming seas release massive amounts of methane trapped in tundra soils and in clathrates (methane ice) on the ocean floor. Methane is a greenhouse gas about 20 times as potent as carbon dioxide on a 100-year timescale. In his speech to the UN, Obama also paid lip service to helping poorer nations through “climate assistance” programs. But this assistance has not come from the international “Green Climate Fund” set up by the sham Copenhagen Accord, which promised to raise $100 billion a year from developed nations by 2020. From 2009 to present, the fund—which is presently controlled by the World Bank, infamous for pushing poverty-inducing “structural adjustment” policies on debtor nations—has raised a paltry $2.3 billion total. In comparison, the U.S. military budget for FY 2015 is $756.4 billion. The fund seeks to develop privately held renewable energy projects throughout the continent. These projects have no intention of replacing existing fossil-fuel energy sources. Rather, the goal is to wring profits out of new energy consumers, turning what absolutely should be developed as a common good into a private commodity for the benefit of wealthy investors. The second Obama program is the “Feed the Future Initiative,” launched by USAID in 2010 and incorporated into the World Economic Forum’s “New Vision for Agriculture” in 2011. At that gathering of the business elite, the head of USAID ballyhooed the program’s 17 agribusiness “champions”—among them Archer Daniels Midland, Kraft Foods, Wal-Mart, and Monsanto—who will receive $3.5 billion in U.S. taxpayer subsidies to invest in “profitable, modern commercial farming and agribusiness” in sub-Saharan Africa (according to the Pesticide Action Network). The kind of large-scale export-oriented agriculture this vision entails plays a significant role inworsening climate change. The countless small farmers it will displace use far less polluting pesticides and petroleum-based fertilizers, and “may be best poised to lead the way in adapting to a warmer world and ensuring the security of the global food supply,” according to a May 2 article in National Geographic. The third program—establishing a “free trade agreement for environmental goods”—was announced in 2013 and includes 13 WTO member nations. According to the White House fact sheet on the initiative, “the [Environmental Goods Agreement] aims to eliminate tariffs on environmental technologies such as wind turbines, water treatment filters, and solar water heaters.” In other words, it seeks to increase global dependence on U.S.- and E.U.-manufactured renewable energy systems and prevent any homegrown renewable energy manufacturing from taking hold in poorer countries where such jobs are desperately needed. This is to say nothing of those initiatives that went unmentioned in the speech, such as the Obama administration’s push for development of fracking overseas. Hydraulic fracturing, or fracking, was exempted from most U.S. environmental regulations in 2005 and has poisoned the water supply of thousands of farmers and rural residents. The half-million active fracking wells in the U.S. release 4-8% of the heat-trapping methane they produce directly into the atmosphere. The administration has pursued a gung-ho fracking policy—at home as part of Obama’s “all of the above” energy strategy, and in the form of ‘technical assistance’ to dozens of countries the U.S. regards as strategic allies to develop their own fracking operations (with investments by U.S. fossil-fuel companies, of course). Taken together, these three initiatives create a web of dependence on U.S., European, and to some extent Chinese capitalists designed to ensnare those nations most at risk from climate change, using that very risk as PR bait. These Obama-style “development” initiatives simply paint a Green veneer over the same profit-driven mentality that has led the world into the current climate crisis. Instead of pushing corporate hegemony, the advanced capitalist countries should be paying poorer nations directly to develop their own renewable energy systems and support small farmers who use techniques to grow food that work best with the local ecology. And future protests should put this demand for real climate justice front and center, diametrically opposed to the corporate colonialism pushed by Obama and company. We should build on the momentum generated by the Climate March to generate organizing for immediate fights like stopping tar sands pipelines, oil trains, and fracking wells. But we also need more mass actions to promote unifying demands. These will be the demands that best draw in new forces to not just broaden but to deepen and strengthen the movement against climate change. Let us stand for 100% renewables, for an end to all fossil fuels, and for a massive public investment in climate jobs to fuel the transition. Let us demand the government support the conversion of defunct auto factories into worker-run mass-transit-vehicle production facilities. Let us require a heavy tax on the sources of carbon emissions, and let us also outlaw those sources over the next decade. Let working people, environmentalists, farmers, and anyone who represents the interests of the 99% come together to decide upon next steps and shared demands for future mass actions. > The article above was written by Carl Sack.